Mars may be a frigid, dusty wasteland today, but evidence is mounting that the Red Planet was warm and wet long ago. Future missions to Mars will seek out signs of life from that livelier era—and a recent geologic analysis has revealed where we should begin our search. A new study led by researchers at NASA and the SETI institute has uncovered widespread evidence for carbonate rocks in Mars’ Huygens basin, a sprawling, 280 mile (450 km) wide region of low-lying terrain lined with impact craters. The rocks, which are estimated to be 3.8 billion years old, offer compelling evidence of a mild, marine environment featuring Earth-like chemistry. Much of the surface of Mars is etched with dried out riverbeds, deltas, and other physical features indicating a wetter past. Atmospheric evidence even suggests that a large portion of the planet’s surface was once covered by an ocean. But this only tells part of the story. To know if Mars’ ancient marine habitats were truly Earth-like, we need to know what specific types of minerals were present. One mineral group of particular interest is carbonates, which form throughout Earth’s oceans from dissolved CO2 under neutral to slightly basic pH conditions. 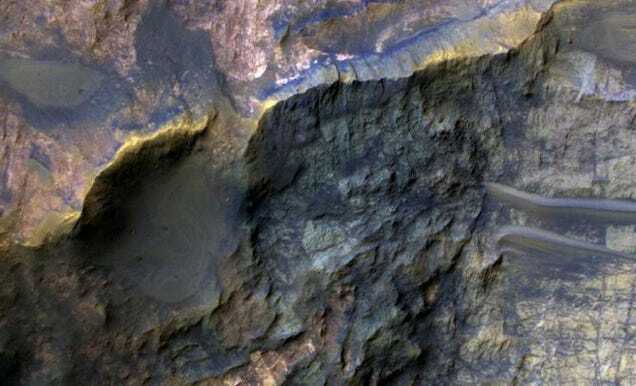 Over the years, scientists have accumulated scattered evidence for carbonate minerals on Mars. Now, using high-resolution surface images and spectral data collected with the Mars Reconnaissance Orbiter, Bishop and her co-authors have pinpointed thick carbonate outcrops across Huygen basin, showing that these rocks are far more widespread and abundant than we realized. They could, in fact, be our first hints of a buried seafloor stretching across a vast swath of the planet. From a biology perspective, this is exciting for two reasons. One, Martian carbonates may preserve a record of one of the most habitable environments on Mars—including, perhaps, ancient Martian microfossils. Two, carbonates on Earth can be produced by life forms directly. Corals, mollusks, and marine microorganisms all precipitate calcium carbonate shells. By examining the isotopes contained in Martian carbonates, we may be able to learn if they, too, were biological in origin. Bishop and her collaborators are now drilling deeper into the specific chemistry of Martian carbonates, with the hope of learning more about Mars’ past environments and finding the most promising habitats for life. Eventually, this data could help guide NASA’s Mars 2020 mission, which hopes to collect samples that would eventually be returned to Earth for more detailed analysis. With those sorts of odds, who wouldn’t want to go fossil hunting?